Well, that didn’t take long, did it? Looks like Taylor Swift and Apple made “nice, nice” after this past week’s -uhm – “misunderstanding“. 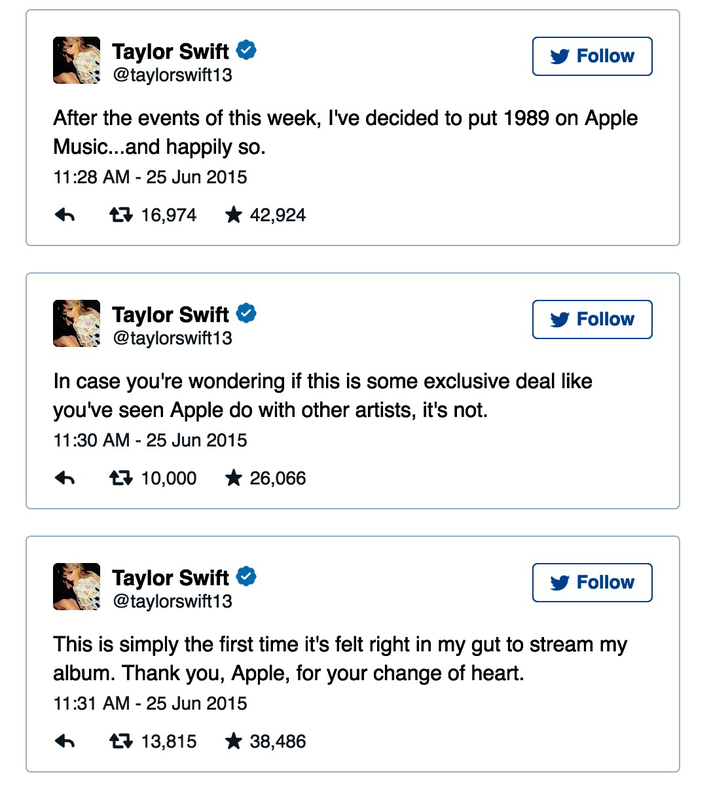 According to Taylor Swift’s Twitter account, the popular recording artist has decided to release her 1989 Album for streaming on Apple Music. Apple Music is scheduled to go live on Tuesday, June 30th and, although Taylor Swift stipulated that the album will initially be released to Apple for live streaming, it will be available to other streaming sites, such as Spotify, in the future. Just not now. Because that would not play well with Apple. So, as predicted here a couple of days ago, it seems that this lovely, very creative and oh so fun PR stunt played out as planned. And just in time for the launch of Apple Music. I love when show business and technology collide. My two favourite worlds. Steve Jobs dream really has come true over and over and over again. Now that two days have past and I have had time to contemplate the supposed brouhaha between Taylor Swift and Apple, a different sort of light is shining on this historic event.